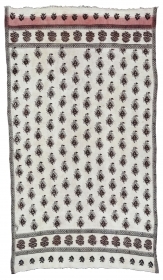 active since June, 26, 2008. 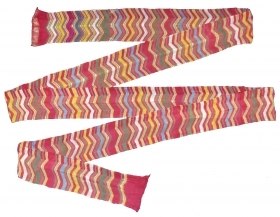 Khadi (Cotton) Striped Jail Dhurries From Kutch Gujarat,India.C.1900.Good Condition. 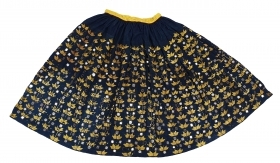 Its size is 160cmX242cm(Large-size)(DSC05321). 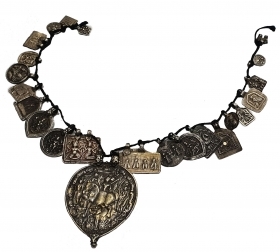 Antique Indian Silver Pendant necklace of Hindu God Figure, From Kutch Gujarat India.22 different kind of Pendant.C.1900(163726). 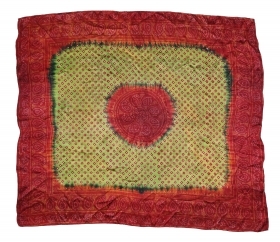 Kantha Quilted and embroidered cotton Kantha Probably From Midnapore District, West Bengal (India)region. 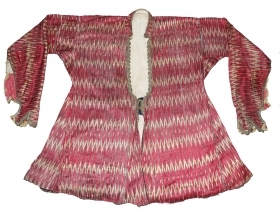 India.C.1900. 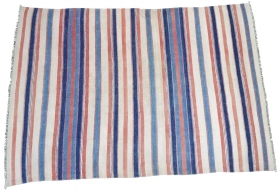 Its size is 62cmX86cm(DSC05667). 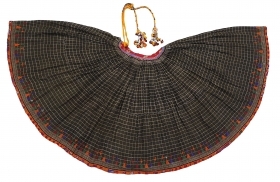 Multi-Colour,Lahariya Tie and Dye Mothara Turban(Child) From Sekhawati District of Rajasthan. India.Its size is near by 5 to 8 miters(DSC05549). 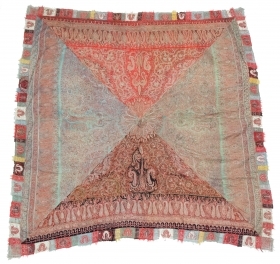 Tie And Dye Rumal, Gajji-Silk From Kutch,Gujarat, India.C.1900.Belongs Khatri Muslim dyers Community of Kutch Gujarat for there Wedding use.Its size is 61cmX70cm(DSC05419). 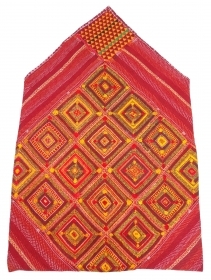 Phulkari Swatti Shawl From the Swat region of Pakistan. 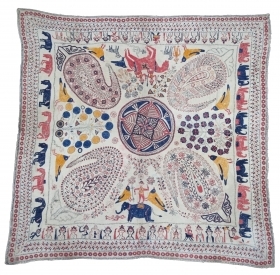 India.Silk embroidery on cotton,Circa Mid-19th Century.Its size is 112cmX236cm(134251). 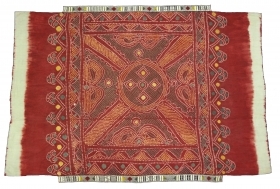 Ceremonial Odhani Block-Printed,Mordant-Dyed Cotton,From Sanganer Rajasthan, India.Its size is 100cmX172cm(DSC05234). 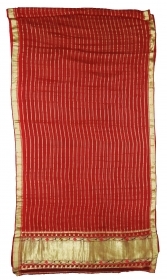 choga costume(silk) Made for Royal Nawab Family of Deccan,Probably Hyderabad South India, India.C.1900.Its size is L-109cm,W50cm,S-16cmX62cm(DSC05205). 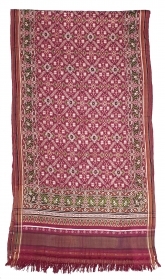 Chaukora Dupatta from the Deccan Region of South India.The Chaukora or the square veil has the charbagh pattern.Its size is 178cmX180cm.C.1900(DSC05063). 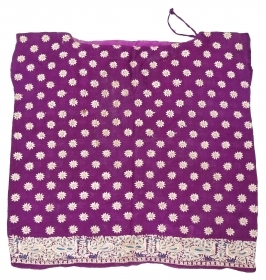 Ghaghra(Skirt)Indigo-Dyed Cotton Embroidered in floss silk and embellished with mirrors,From North-Western Region of India. 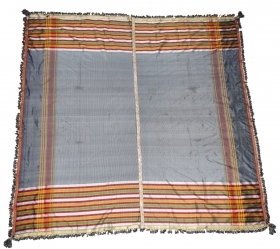 India.C.1900.Its size is L-92cm Around is 365cm(20190312_144502). 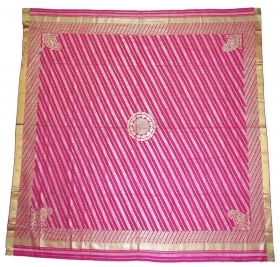 Abochhini Wedding Shawl from Sindh Region of Undivided India. 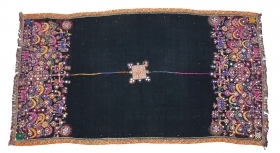 India Silk Embroidery on the Cotton, c.1900.Its size is 146cmX210cm(DSC02382). 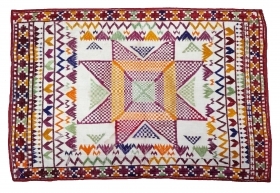 Dowry Chakla(Cushion) from Mirpurkhas Region of Sindh, Undivided India. 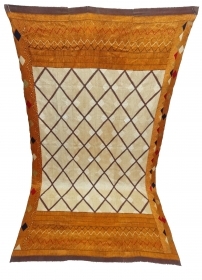 India. 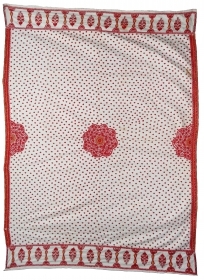 Cotton with Silk Embroidery with Roller Print Backing,Its size is 40cmX60cm.C.1900 (dsc04748). 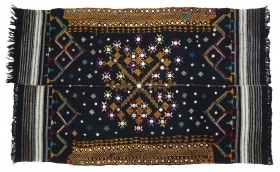 Abochhini Wedding Shawl from Sindh Region of Pakistan, India, Silk Embroidery on the Cotton, c.1900. 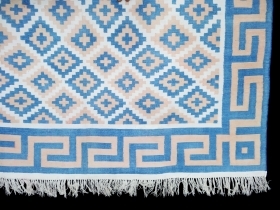 Its size is 120cmX200cm(DSC02392). 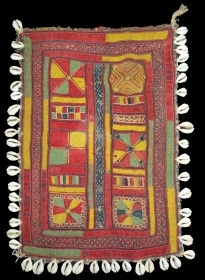 Phulkari From West(Pakistan)Punjab. 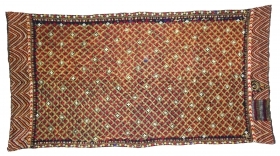 India.Known as Chand Bagh.C.1900. 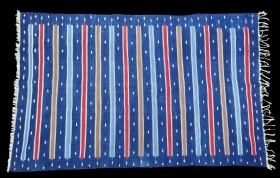 Floss silk on hand spun cotton ground cloth(DSC04729). 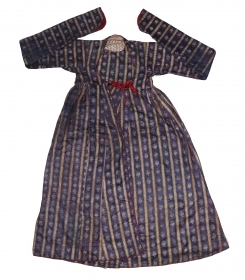 Rare Kantha Embroidered cotton Kantha Probably From Jessore District, East Bengal(Bangladesh)region. 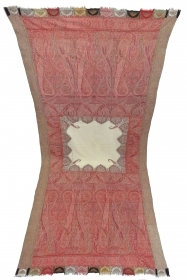 India.C.1900. 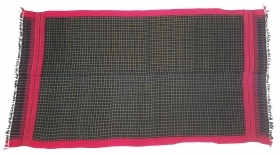 Its size is 95cmX95cm(DSC04672). 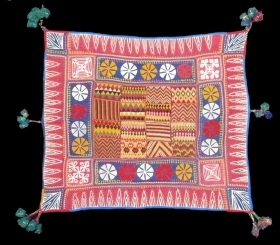 Phulkari(Bagh)From West(Pakistan)Punjab. 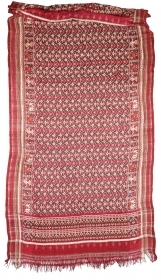 India.Fine Work with Panchrangi Border Design,Floss silk on hand spun cotton ground cloth(DSC03531 New). 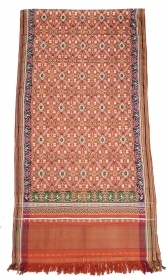 Sikh Period Jamawar Long Shawl From Kashmir, India.C.1830-1860.Its Size is 133cmx302cm. 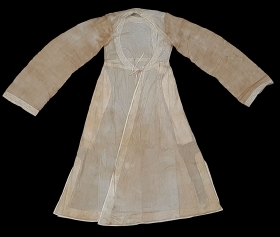 Its condition is good(DSC04361 New). 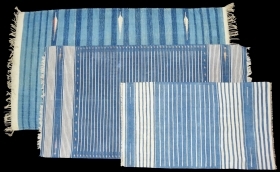 Three Different Style and Size Indigo Blue,Jail Dhurries(Cotton)Blue-White striped with mahi motif. 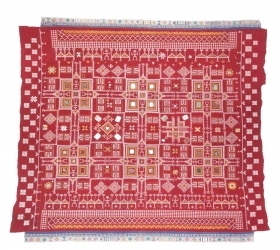 Bikaner, Rajasthan. 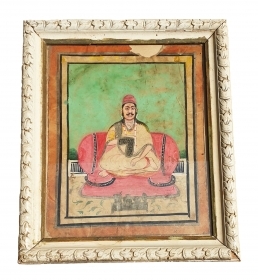 India.C.1900.Good Condition(DSC04436 New). 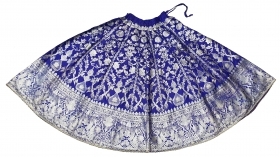 Ghaghra Zari (Real Silver)Brocade Skirt(Ghaghra)From Varanasi,Uttar Pradesh. 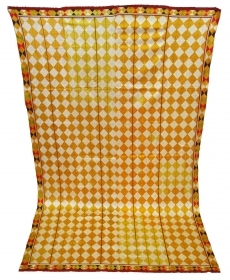 India.Known As Marvadi Ghaghra.Its size is L-95cm circle is 423cm(20190127_161003). 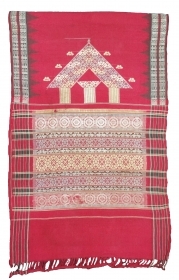 Ceremonial Chamba Odhani, From Himachal Pradesh, India. 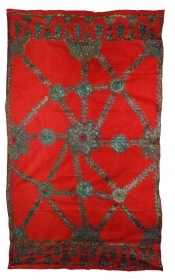 C.1900.Silk ground with floss silk embroidery.Its size is 130cmX230cm(162027). 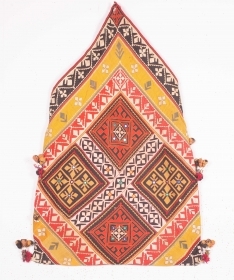 Phulkari Swatti Shawl From the Swat region of Pakistan. 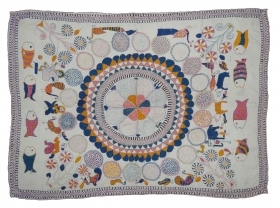 India.Silk embroidery on cotton,Circa Mid-20th century.Its size is 105cmX208cm(170903). 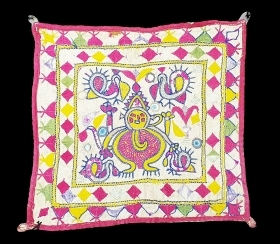 Ganesh Sthapana Wall Hanging From Saurashtra Gujarat.India.C.1900.Probably from Kathi Darbar Group.Its size is 27cmx28cm(20190119_161242). 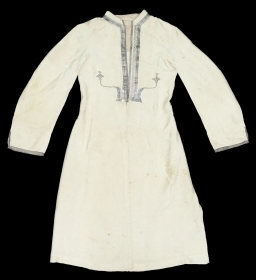 Angarkha(Coat)Child fine Muslin Cotton with Chikan Lace Work,From Deccan ,South-India, India.C.1900.Worn by Royal Nawab Muslims Family Of Deccan(20190117_124333 ).